sorry, but I don’t understand - to which notepad++ functionality are you refering to? Hi Claudia–In the past, in Notepad++, I was able to click a button (top right) and connect to my website. I would then save my edits in Notepad++ and voila, my text changes were made on my website. Does that help make my situation more clear? Thanks much. that this was the ftp plugin? Did it look like this? you also have to know the credentials of the ftp server you used and how you set it up. 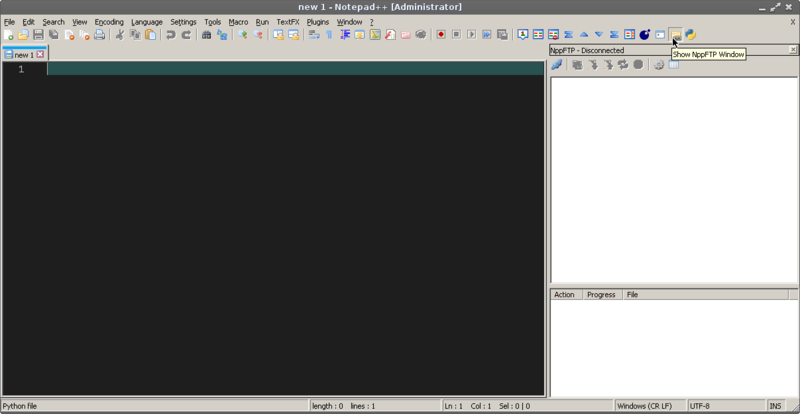 YES–that’s precisely what Notepad++ used to look like–thank you, Claudia. But my problem now is how to import that particular plug in … my web person is away and I guess I need some step-by-step advice re what to do now that you’ve diagnosed the problem . can you please post your debug-info? This is available under the ? menu. If it asks whether you want to overwrite plugin directory say yes. If so, back it up to a save place - it might contain the configuration and credentials from your ftp server setup. Restart notepad++ and check if you can connect to your ftp server. If everything is ok - done. If you can’t connect, try to replace the newly created files with the files backed up in step 3. If this still doesn’t work then I assume you need help from your web person to get the setup done. I’m totally flummoxed … and confused, even. You’ve been great and I understand if you don’t want to fuss with this any longer – but I thought I’d inform you of this most recent roadblock. Let me know if you have any other suggestions. Thanks much! if you don’t see the plugin manager then I have to assume that step 2 failed. After you downloaded the zip, how did you proceed? I downloaded the zip file to the C:\Program Files\Notepad++ directory. So far so good. BUT I get hung-up on Step 3–I can’t find either of the %APPDATA directories you cite. Neither can I find an NppFTP directory. And, as I mentioned, I do have the downloaded PluginManager but I just can’t seem to access it within notepad++ (see my last note/plea). let’s try to sort out plugin manager issue first. do you see a pluginmanager.dll ? Yes - I also, somehow, have two folders labeled C:\Program Files\Notepad++\PluginManager_v1.4.9_x64 - each has a plugins folder. You are still using Notepad++ v7.5.4 (64-bit) - you didn’t install the 32bit in the meantime, didn’t you? How big is the file C:\Program Files\Notepad++\plugins\PluginManager.dll ? Deleted those two folders–and no, I didn’t install the 32 bit Notepad++. The C:\Program Files\Notepad++\plugins\PluginManager.dll file is only 505 kb. Looks ok - the zip states it is 516608 bytes. Didn’t you get any info that notepad++ was not able to load a dll when you start npp? It is in the right directory, is a dll … should work or complain if it can’t be loaded. No–received no info re inability to load a dll when starting Notepad++ … so I guess I’m at a dead end until my webmistress comes back. Don’t even know to whom I can contact/complain to at Notepad++. Sorry, currently I’m running out of ideas, not sure what we are missing here - don’t like such situation. Maybe a good sleep will reveal the hidden secrets - already 2 o’clock in the morning - good night. Many thanks to Claudia for her assistance–but I still haven’t been able to link Notepad++ with my website. I used to be able to see in Notepad++ a button that enabled connection to the net. Any others have some thoughts? The “other thoughts” are that you still have not successfully installed the plugin manager, let alone the NppFTP plugin. Until you are able to do that, you will not have the button. Your ? > Debug Info claims you have installed 64bit Notepad++ in C:\Program Files\Notepad++\notepad++.exe. After you opened your downloaded PluginManager 1.4.9 x64 zipfile, you should have extracted the contents into C:\Program Files\Notepad++\. After ensuring you’ve done that, please close Notepad++, then open it again (making sure it re-reads the list of plugin DLLs) and give us the ? > Debug Info again. and copy and paste the full results into here (as shown below in pasting data). Note that it will give us the complete contents of your Notepad++ executable directory structure and your Notepad++ AppData structure. If you have any sensitive filenames listed there (or if you wish to hide your windows user name) , just xxxx them out before pasting in the forum. Please note: some people get confused between %APPDATA%\Notepad++ and %APPDATA%\roaming\Notepad++. On all modern Windows configurations (everything Since Win7, and probably since Vista), %APPDATA% exapands to c:\users\name.here\AppData\Roaming (or similar, depending on your system). And on versions before then, there was no ...\user.name\AppData\Roaming, so you should still use %APPDATA%\Notepad++. So unless I’m very much mistaken, if you were really looking for %APPDATA%\Roaming\Notepad++, as you quoted from Claudia’s post, you wouldn’t find it. If you really meant you looked in ...\username\AppData\Roaming\Notepad++, then that would be the right location for your Win10 system. as this forum limits the number of characters one can post).